A 10-minute turn signal tidy up might save you a ticket — and some embarrassment, too. Clean, rust-free electrical contacts are critical requirements when it comes to the electrical system on a collector car. When corrosion builds up on a turn signal socket, it can cause burned out bulbs, blown fuses and electrical system shorts. Corrosion on electrical connections can take the form of a thick layer of dirt, a chalky green build up of crud or ordinary rust. Anything that prevents good metal-to-metal contact can create an open circuit or contribute to a poor ground. As a result, your turn signal blinkers may work intermittently or not at all. If your blinkers aren't indicating your driving intentions, you could get a fairly expensive ticket. Worse yet, tailgating drivers (very common around old cars) may bump into you if they don't know you're making a turn. There is also the possibility that a short or open ground could start a fire. Any way you look at it, inoperative turn signals are dangerous and potentially costly. If your car sits a lot, condensation can form behind turn signal lenses, especially if the cork or rubber gasket is missing or very ancient. Old cork can dry up and shrink, which makes for a bad seal. Old rubber can get brittle and fall apart. 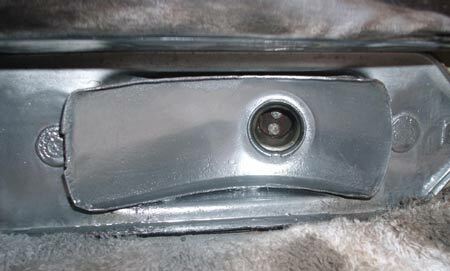 Condensation and leaks can let moisture attack the turn signal housing. If the moisture sits inside over long periods of time, it can cause corrosion. 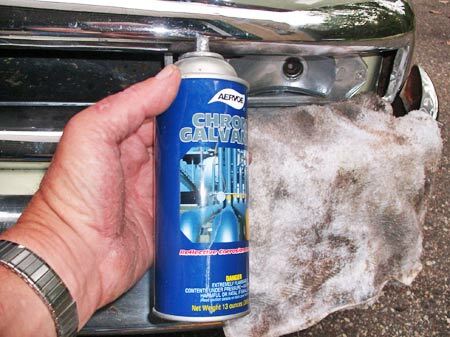 If you don't check for corrosion periodically, you may get into an embarrassing situation. Let's say you drive the car to a barbeque and the blinkers start acting up. If you're lucky, you'll have tools and spare fuses and bulbs with you, but you may still find yourself doing repairs while everyone else is having fun. If your blinkers don't work at all, you may have wiring problems or a blown fuse. Major repairs to the wiring system of an old car can rarely be done on the road, but broken wires are usually easy to spot and simple to repair. If you carry wire connectors and electrical tape with you, broken wires that you can see should be easy to fix. 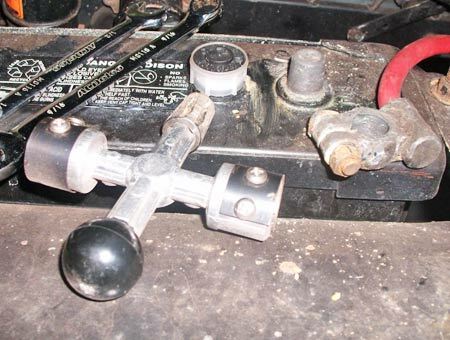 Most collector cars use old-style cylindrical glass fuses. Cars made up through the 1940s usually had only a few circuits protected by fuses. Most of these cars did not even come with signal lights. If someone added blinkers to the car, you will have to replace the blown fuse with one of the same size and amperage. The same fuses are used in both 6-volt and 12-volt electrical systems, so new fuses should not be very hard to get. However, since color-coded plug-in fuses are becoming more common these days, it doesn't hurt to carry spares of the old-style fuses in the car. On many old cars, the builders were thoughtful and left space for replacement fuses right on the fuse blocks. If you find that the fuse on your turn signal circuit has blown and you don't have a spare with you, check to see if other accessories that you can do without for a while use the same capacity fuse. For example, you may be able to swap the fuse from the radio circuit into the signal light circuit for the time being. A plastic fuse remover that you squeeze over a glass fuse can make removal of fuses easier and safer. Keep one of these in your glove box. If your problem is a burned out light bulb, you will probably see the indicator lights on your dashboard acting funny when you signal for a turn. They may all flash or you may see the lights on only one side flashing. On some cars, the lights on the side with a bad bulb will not flash and the lights on the other side will remain steadily lit. Unlike fuses, light bulbs come in 6-volt and 12-volt models and they will usually not work properly if mismatched. As you may have guessed, we had a turn signal problem arise during a trip. The car was about 250 miles from home when the dashboard turn signal indicators began to act up. The right turn indicator did not flash at all. The left turn indicator would flicker once, then stop flickering. A walk around the vehicle revealed that the turn signals on the right side were both working fine, even though there was no dashboard indication of this. The front left turn signal was not working at all. The left rear turn signal was blinking, but much more rapidly than usual. 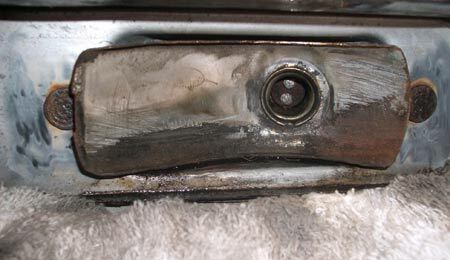 After arrival at the Car-B-Que, tools were extracted from the trunk and the front left turn signal housing cover was removed. It was noted that the cork gasket was installed and in good condition. Corrosion was evident and it had been caused by condensation, rather than leakage. The socket was brown in color, rather than a brassy yellow. The bulb in the socket had a frosted white "blown" appearance. Checking the fuse blocks under that hood and under the dashboard revealed no blown fuses, which was fortunate as there were no spares in the car. There were two spare No. 1154 light bulbs in the glovebox and both of them looked good. At first, the frosted bulb could not be removed. It was frozen in the corroded socket. On-the-spot repairs at the gathering were attempted. With a little coaxing, the old bulb came out. It was necessary to push back on the spring-loaded fiber disc at the rear of the socket, but it wasn't easy to do this without a tool. The pointed probe of an electrical tester in the toolbox did the trick. This tool was also used to scratch the two contact points on the fiber disc clean. Installing a new bulb was difficult. The sides of the sockets were covered with rust. After a little scratching with the electrical probe it was obvious that the rust wasn't too bad to clean up. Eventually it was possible to get the new bulb into the socket, but it blew as soon as the ignition key was turned. In rushing the repair at the party, the battery cables had not been disconnected. Since the on-the-spot repairs weren't working out well, it was decided to drive home with no front left-hand blinker, using hand signals instead. Continued checking showed that all other lights were working OK during the entire trip. Still, it is not a comfortable feeling to drive that far with no front left-hand signal light. At home the next day, a proper repair was attempted and took only 10 minutes or so. This time the battery cable was disconnected (which was a perfect opportunity to clean the battery cable and post, too). The turn signal door was removed, along with the lens and gasket. The lens on this old car was made of glass, so careful handling of that easy-to-break part was in order. Before doing any electrical system work, it's a good idea to disconnect the battery cable to avoid blowing out your emergency bulbs of you create a spark. While you have the cable disconnected, clean it and the battery post. The reflector that surrounds the bulb and socket is supposed to be shiny to multiply the light the bulb creates. This one had a heavy coating of dirt and oxidation and had quite a bit of light corrosion on its lower portion. A wire brush on a Dremel tool did a great job of cleaning up the socket. In a minute or two the brass looked like new. The small wire brush also did a much better job of cleaning up the electrical contacts on the fiber disc so the bulb would make a good connection. The rectangular reflector that surrounds the bulb had some corrosion on it, particularly at the bottom, toward the lower right corner. This was wire brushed, lightly sanded and sprayed with the Aervoe Chrome-Galvanized paint that Eastwood sells after using old rags to protect the chrome parts from overspray. This special paint creates a shiny, chrome-like look. 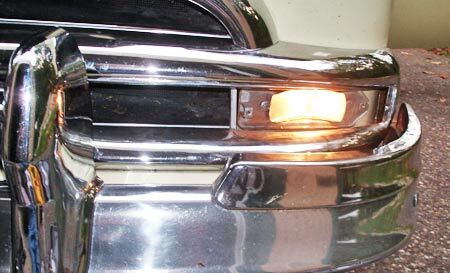 If you are doing a show restoration, there are companies that will re-silver a parking light reflector. This car is more of a 'driver' so the Aervoe Chrome-Galvanized paint from Eastwood worked well for this repair. A new bulb was installed and the battery cable was re-connected. Then the ignition key was turned to the on position and the signal light stalk was pressed down. The dash indicator now worked correctly, suggesting that the repair worked fine. This was confirmed by checking the blinker from outside the car. Then, the gasket, lens and chrome door were re-installed. The Aervoe Chrome-Galvanized paint from Eastwood gave the reflector a shiny, chrome-like appearance that should reflect light. And it certainly will protect the reflector from further corrosion. After the signal light housing was tidied up and all of the parts were re-installed, the front left-hand blinker worked fine. The next step is to check all the other light housing front and rear so that the same road emergency is avoided. The next step was to check all of the other directional light housings and tidy them up where needed. Chances are pretty good that if one has corrosion, the others do as well. This repair went so much faster and better at home, it just makes sense to check all the other lights while the car is in the garage. Emergency road repairs are a pain — especially at a big barbeque.